Thanksgiving will be here in no time, and if you are hosting the big feast this year it is a great idea to have some cleanup tips and tricks on hand. With a large number of people in your home consuming large amounts of food it is highly probable that your home will see an accidental stain or two. One of the biggest post-Thanksgiving headaches is an accidental stain in the carpet. 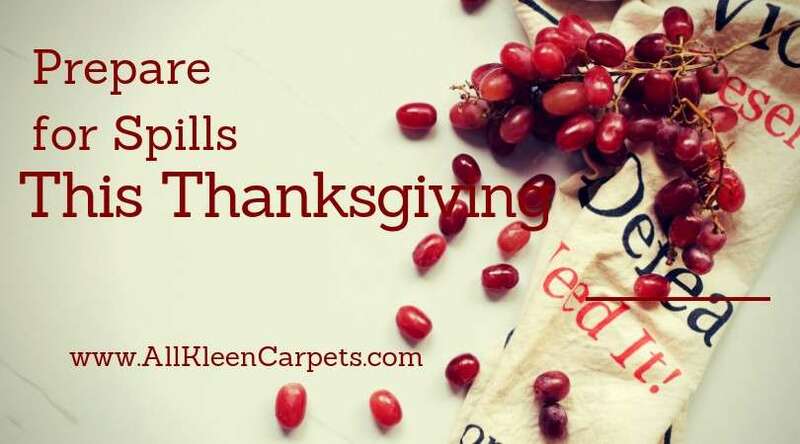 The best way to ensure success with removing Thanksgiving stains in your carpet is to be prepared before they even happen with some basic carpet cleaning supplies on hand and a little spot treatment know-how. In addition to all the food for the feast, you will want to add these items to the grocery shopping list. Make it super easy and stick them all together in a basket/tub/bucket so they are ready to go when you need to treat a spill. Now that you have the right cleaning tools on hand, it is good to know how and when to use them. Here are a few common Thanksgiving spills and how to clean them up. Cranberry from juice, sauce, pie filling, can cause a stubborn stain. As soon as you discover cranberry anything on the carpet you will want to treat it right away. Start by mixing up a tablespoon of hand dishwashing liquid with two cups of cool water. Dip a paper towel or cleaning cloth into the solution and gently blot onto the stain. Continue blotting with clean areas of the cloth until the stain has been removed. To remove gravy from the carpet, start by scooping up as much of the gravy from the floor as possible. After you have removed as much of the gravy as possible, sprinkle cornstarch over the remaining stain and let it sit for at least 15 minutes. When the cornstarch has had time to absorb the grease from the gravy, vacuum it up. If you need to repeat the cornstarch because there seems to be a lot in the carpet do so. Follow the cornstarch with a half and half mixture of vinegar and water applied with a spray bottle. Blot with a towel or cloth after spraying the stain. Apply more weight to absorb as much of the stain as possible. Repeat until the gravy is gone. Spilling red wine on the carpet can send anyone into panic mode. If you attend to it quickly it is possible to remove it. The surprising anecdote to a red wine spill is white wine. Start by soaking up as much excess wine from the carpet as possible with a plain dry cloth or towel. The more weight and pressure applied in this process the better. Pour white wine into a spray bottle and lightly mist the stain and then soak it up into a clean area of towel. Repeat this process until the red wine is completely removed. With any spot removal treatment, you attempt there are some general best practices you should employ to avoid damaging your carpet. Always test new cleaning products on unseen areas of the carpet before applying to a stain to ensure it is safe to use on your carpet. Always gently blot never rub unless instructed to do so. Rubbing can fray carpet fibers. Work from the center of the stain outward to avoid spreading the stain to a larger area. Use white cloths or plain paper towels to avoid the risk of transferring dye into the carpet. Never soak your carpet it can cause rippling, stain recurrence, mold, pushing the stain to the padding, etc. Place a clean dry towel weighted down with something heavy on wet areas post cleanup to get the area dry again as quickly as possible. If you have a stain that just won’t come out no matter what you try give us a call at All Kleen. We provide stain removal services and professional carpet cleaning in Woodinville and surrounding areas.